This year Montroyal is aiming to have 100% participation and we need YOU. 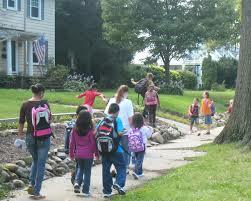 Help us to get everyone walking, biking, skipping or scootering to school. Why pick one? Try something different each day...did you know skipping is not just for children? Parents can join in the fun. Get creative and send us your photos. Start NOW...get those bodies moving. We are fortunate enough to live in one of the most beautiful cities in the world! It's a wonderful way to connect to nature. You children will be happier, healthier, be more attentive in class (and may even sleep better)!! These are simple steps that families can take to contribute to a healthier, more sustainable community. Walking or biking to school gives both parents and kids the opportunity to develop friendships, learn and practice traffic safety skills, get fit and have fun! Live out of the catchment – then try DRIVE to 5. Drive to 5 minutes away and walk from there.